this has become my soul mantra of late. i uncover and shift and look inward and move the truth, move myself, into the light. i walk toward the lightness and let go of (some of) the patterns that seemed to serve me. i see those patterns for what they are. i see how those patterns held me close in the darkness. i insist that they release me. i (try to) no longer ignore or push away or pretend. i take off the blinders. i cannot see me in the darkness. i bring the truth that sits inside me. i bring the truth that is my truth that is nestled inside the wisdom i have had all along. i stand in the light. i feel the light, the warm yellow healing light, surround me. i see this life that is me. 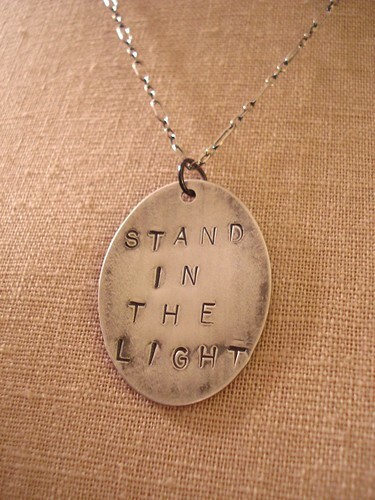 i have added the stand in the light soul mantra necklace to the shop. 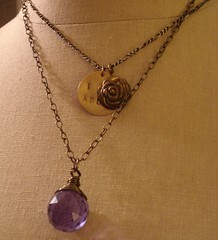 it is available in brass and sterling silver. the i hope soul mantra necklace is also now available in sterling silver.